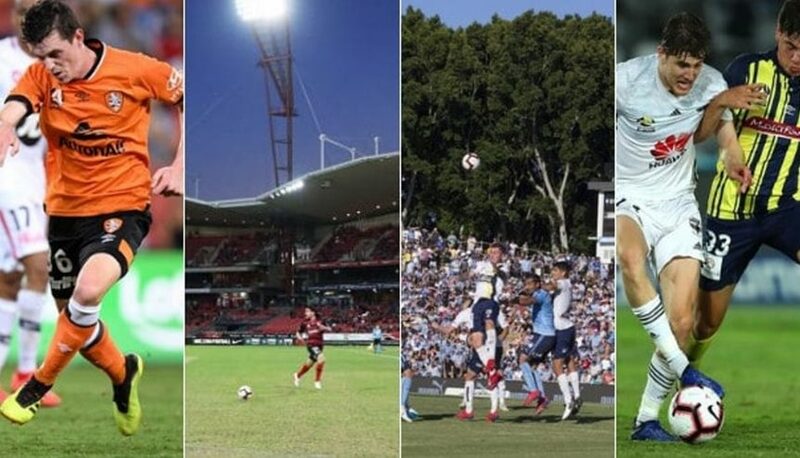 They’re Australia’s poorest pitches, the sub-standard surfaces the players’ union is concerned could be contributing to injuries across the A-League. And Queensland’s flagship Suncorp Stadium is rated one of the worst of the bunch, coming a lowly 14th in the list of 16 venues with a score of 2.83 out of five in Professional Footballers Australia’s stadiums rating system. The nation’s worst was Spotless Stadium, Western Sydney Wanderers’ unhappy temporary home where, just before kick-off last November, shards of broken plastic cups and even a metal screw were blown onto the pitch following a music festival. Three of the four fixtures held at Spotless this season – including shardgate – received a lowest-possible mark of one out of five by team captains who rate the overall quality, hardness, pace and smoothness of playing surfaces at the conclusion of every game. Along with that 1.67 season pitch score, the AFL-purposed oval venue was assessed as providing the worst atmosphere of all 16 stadiums used for the A-League with an average score of 1.33. Intriguingly, last season Spotless was adjudged to boast the equal third-best pitch, with a ranking of 4.00 that underscored an overall better-quality standard across the board in 2017-18. Leichhardt Oval, which braved Sunday’s torrential rain to host Sydney FC’s loss to Melbourne City, is this season’s second-worst of the lot with an average overall quality of 2.50. The PFA has raised serious concerns about the safety and playability of pitches, and chief executive John Didulica drew attention to the ACL injury sustained by Sky Blues defender Ben Warland at Leichhardt. (l-r) Four A-League grounds and their pitch ratings out of five: Suncorp Stadium, Brisbane (2.83), Spotless Stadium, Sydney (1.67), Leichhardt Oval (2.50), Central Coast Stadium (3.10). “In our game, the quality of the playing surface afforded to the players is critical,” Didulica told The Daily Telegraph. “It is impossible for any player to play to their capacity when a fundamental component of the game is compromised. “When the pitch is compromised, there is a heightened risk of injury to players. Sydney FC’s other temporary grounds, Jubilee Stadium and the SCG, have ratings of 3.38 and 3.50 respectively. Jubilee in particular has come under recent fire over the state of its surface, one that deteriorated so badly both an NRL trial and the Matildas’ Cup of Nations opener were forced to relocate. It was also in a patchy, uneven state for the preceding week’s W-League grand final, however the Sky Blues have since enlisted the help of an independent pitch consultant to work with Jubilee’s groundsmen and managed to get it match-ready for the start of the men’s Asian Champions League campaign. Campbelltown Stadium came in at 3.00, just behind Brisbane’s notoriously patchy Suncorp Stadium (2.83, down from 3.05 last season), while ANZ Stadium has a rating of 3.80 (down from 4.00). Compare that to Mudgee’s Glen Willow Stadium, a bed of carpet that earned a perfect 5.00 when it hosted the Wanderers against Brisbane Roar in November. Perth’s HBF Park (4.45, up from 4.13) and Melbourne’s Marvel Stadium (4.17, up from 3.60) are the next best.